The European Fake Book by Sher Music contains a lot of fresh material and unique tunes that most people haven't had a chance to play, or even listen to, yet these tune are worth taking a look at. You can find mp3 recordings of many of the songs on SherMusic.com so you can get an idea of what you're getting. Sher Music Co. proudly presents The European Real Book! Jazz lovers will surely want a copy of this landmark document, with over 430 pages of tunes by Europe's greatest jazz composers, including Michel Petrucciani, George Shearing, Toots Thielemans, Philip Catherine, Bill Bruford, Tommy Smith, Niels-Henning Orsted Pedersen, Barbara Dennerlein, Claus Ogerman, Nguyen Le, Kenny Wheeler, Django Reinhardt, Enrico Pieranunzi, Tim Garland, Joe Zawinul and 100 others. Publisher Chuck Sher comments, "For sheer beauty, this is the single greatest fake book I have ever published. And the people you have never heard of are the most amazing ones in the book!" 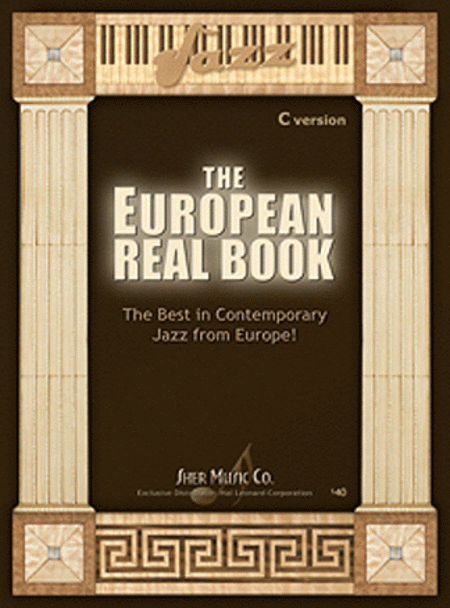 The European Real Book has all the features musicians have come to expect from Sher Music's world-class books: 100% accurate composer-approved charts, easy-to-read manuscript, great tune selection, and many extra features like sample bass lines, chord voicings, rhythm section hits, harmony parts, an extensive drum appendix, etc. Streaming MP3 files of over two-thirds of the tunes are online at www.shermusic.com so musicians can hear the songs for themselves! Jazz educator Mark Levine says, "At last! The New Real Book goes global with the hippest jazz tunes from Paris, London, Barcelona, Rome, Warsaw, Amsterdam..."
When I sat down at the piano with The European Real Book from Sher Music, I had no idea what most of the music would sound like. This is jazz from Europe, not Bird, not Bill Evans, not Richard Rodgers. I played through the entire book, struggled at times, and recognized a handful of tunes. Afterwards I knew what the the musicians I hire must feel when I throw a stack of complicated original music at them during lunch and say, "Downbeat at six tonight." I don't do that any more. Instead, I give them a recordings of the music along with the charts so they have an idea of what it's all about when they are practicing. Chuck Sher knows this music isn't going to be familiar to everyone, so he put together deals and made available free streaming MP3's of somewhere around 140 of the tunes in the book. I decided to take a listen and went through the book again. The recordings gave me a baseline of what the music sounds like. The tunes were beautiful the first time I went through the book, but with the MP3's playing, the ideas behind the tunes came to life. There's not a standard around that we all haven't heard at least once, so when it comes time to play them, we know how they are supposed to sound, which makes it a lot easier. Chuck Sher gives us a chance to have that same feeling with tunes we haven't grown up with by providing recordings of the music. So what makes this book unique? There are a lot of fake books out there. However, most of the fake books cover the standards- Broadway tunes, movie tunes, classic be-bop, etc... Some of Sher Music's books cover more recent tunes, but there has yet to be a book that specifically targets what has become the New World of Jazz: Europe. The jazz compositions in this book reflect the studied nature of jazz and music in general throughout Europe. The tunes are compositionally sound, they flow, and they are fun to play. Some of them also hint at the ethnic backgrounds of the composers, similar to lot of European classical music. It won't surprise me if some of these tunes become part of the "standards" repertoire in the years to come because many of them have that synergy of musicality, fun factor, and room for personal expression that all the great standards have. As usual with books from Sher Music, The European Real Book is beautifully put together. The pages are easy to read, there are often parts for the rhythm section, and the music is annotated to give you hints about how the tunes were recorded and/or intended to be played. I recommend The European Real Book to any musician who is looking for new areas to explore. The fresh harmonies, melodies, and rhythmic aspects in the music are not only enjoyable to play, they will stretch a musicians mind, open new musical doors, and help expand that artistic playground in your subconscious. Get ready for more improvisational moments like, "Wow, that was cool... where did it come from?"